Plymouth-based airline Air Southwest (ASW) is to be sold. Owner Sutton Harbour Holdings made the decision after the airline's operating profits fell by £600,000 in 2009. The move has raised concerns about the effect on businesses and Newquay Airport in Cornwall, which relies on ASW for more than half of its flights. But the managing director of the airport, Al Titterington, said he was confident existing services would continue. ASW, which was launched in 2003, scrapped its London City route from Plymouth earlier in the month. But Sutton Harbour Holdings said Plymouth City Airport, which it also owns, would not be sold. Nigel Godefroy, ASW managing director, said: "We recognise the importance of Air Southwest to Newquay and Plymouth and the far South West. "We want to give it an opportunity to blossom in hopefully a safe pair of hands that will look at developing services if at all possible." He declined to say which airlines the firm was talking to about the sale. 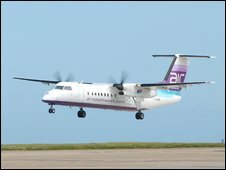 ASW accounts for more than half of flights in and out of Newquay Airport, which suffered the loss of Ryanair flights to Stansted in 2009. Mr Titterington said: "It's being sold as a going concern. It is not going out of business. Flights are not being cancelled. "Air Southwest services will not disappear, but will be serviced by an alternative carrier." He added: "Newquay has proven that there is significant demand for flights to and from the region and we are confident that a new owner of Air Southwest will be keen to maintain and grow services to Cornwall." Tom Gribbin, managing director of West Pharmaceutical Industries, which employs 450 people in St Austell, Cornwall, said: "It's very disappointing for us, we use Newquay Airport a lot. "It is very important that we are accessible internationally, so this is a very big blow to us."